Here below you find a presentation of the down town apartments. They are shortly listed per number of sleeping rooms and beds. Additional sofa beds and cots are usually available on demand. From the list you can log on to the complete information of the apartment, prices for seasons and all other features. Located within walking distance to train and bus stations and to bus stop, it is an accommodation convenient for shops, restaurants, and grocery stores within easy walking distance. Biking trails lead along the nearby river. 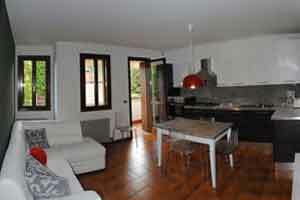 Located in the modern central city, equal distant from historical sites in Serravalle and Ceneda (about 1 km either way). Around the meadow on the top of the town there are Medieval towers with comfortable apartments and studios for rent. This studio has 1 bedroom, 1 bathroom, kitchen corner in the living with large window towards the park. 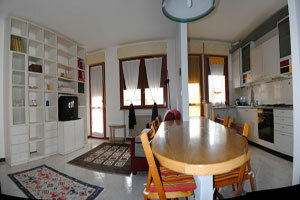 An extension to 4 people is possible, renting a second studio in a separate tower. Inside the Serravalle Castle. It’s a wide apartment with 2 bed rooms for 4 sleeps, with the possibility of an extension to a third bedroom in a separate tower. 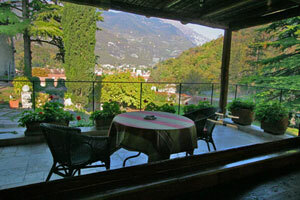 From the garden you can enjoy a 360 degree panorama of the roofs and of the surrounding mountains. It’s an apartment in a XV century building, located in the true Medieval context of Serravalle, at 20 meters from one of the Italy’s most beautiful art history squares, the Flaminio Square in Vittorio Veneto. 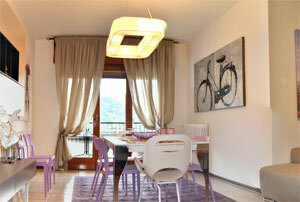 Each member offers his own second apartment for rent to foreign visitors. Whe are a local community of private direct owners for vacation rentals. We do not have our residence in these apartments, that our family uses as a second home. For this reason we decided to rent short- term. Our selection of apartments includes those in buildings with relevance to the history of the town, previously owned by the richest families of the Renaissance, or those beautiful homes, surrounded by gardens and vineyards, where Venetian noblemen have been spending their summer holidays. Whereas some other apartments are in the modern center of the town, in a convenient location near the railway and bus stations, a few steps from the fountain of City-Hall, in front of the cafeteria Lux. The Autostrada connects Vittorio Veneto with the famed Venetian art history cities of Treviso, Padua, Vicenza and Verona. The Venice airport, as well the Treviso-Venice airport, are easily reachable by highway (about 45 km). Each apartment is listed by number of beds and rooms, which also includes the living room. Additional sofa beds and cots are usually available on demand.